Faraday the Blob » Archive » 98. Allez les Blobs! This entry was posted on Friday, June 11th, 2010 at 1:59 am and is filed under Comics. You can follow any responses to this entry through the RSS 2.0 feed. Both comments and pings are currently closed. WAIT A SECOND! THAT WAS A HAND BALL?!?! NOOOOOOOOOO! Love it!!!! Would have been nice if Faraday had eaten Henry, it would give him that extra bit of va-va-voom. 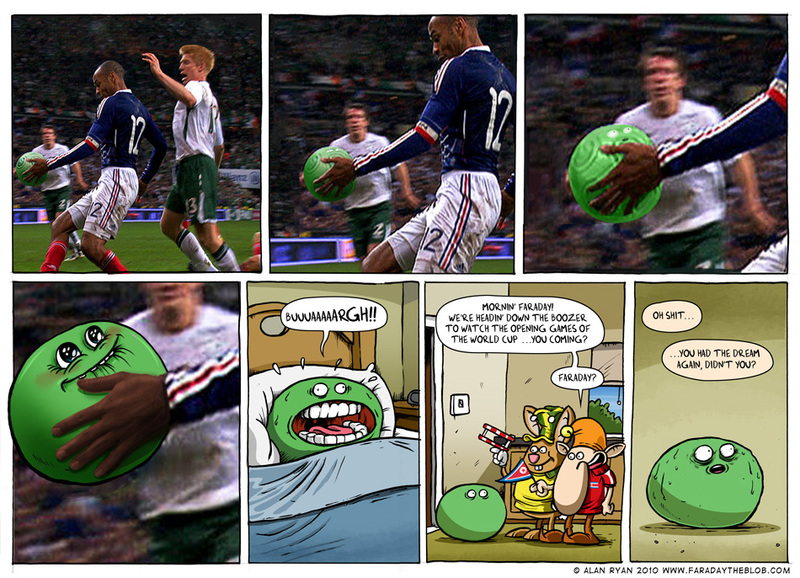 Your illustration style is so f*cking amazing that I don’t even need to enjoy soccer to enjoy your comic. @ Hiller – Faraday once dreamed he ate Henry, but when he woke up his Italia ’90 floaty head collection was gone!! Another time he dreamed that Henry ate him, and when his pillow woke up he was gone!! Encore une fois. Wait, is that adoration for Henry I see in Faraday’s eyes?? Also, good to see North Korea have at least one supporter… I think. Caoimhe – perhaps …What’s really going on in this comic? Mr. Elf supports Korea DPR of his own free will. His support has nothing at all to do with the fact that His Benevolence Murdo Tumbleroot, Grand Proboscis and Chief-Executive-for-Life of Mr. Elf’s homeland of Ouphetania has gently encouraged all Ouphetanians to cheer on his friend the Dear Leader’s brave 11, for fear of death. Ou est la Place Charles De Gaulle?